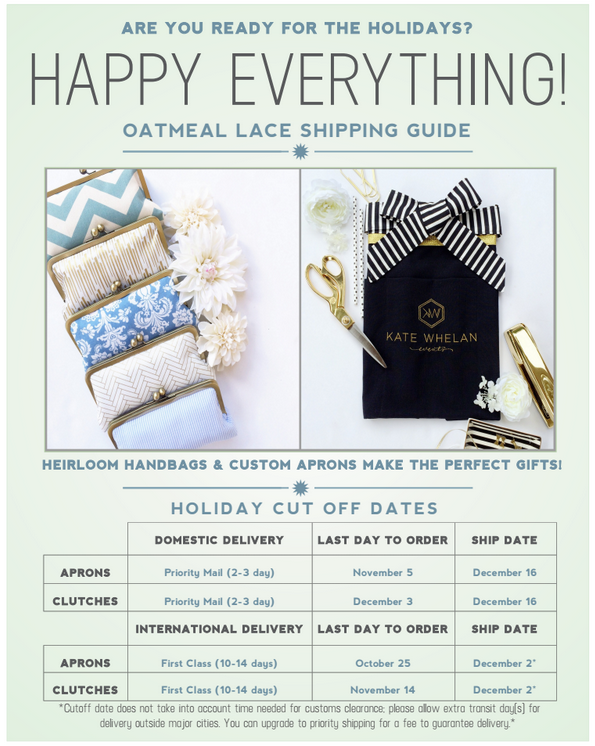 oatmeal lace design: holiday shipping deadlines! I've put together this little sheet above that outlines when you need to have your order placed and when you can expect shipment. if you're planning on buying bags, you still have a little time, but if you wanted to order an apron for yourself or a friend you need to get moving! to get a headstart and determine if an apron is the right gift, go ahead and email me over the logo that you want embroidered (hello@oatmeallace.com). that way I can get you a quote before the deadline to order comes up. you can check out my apron PORTFOLIO for ideas too. feel free to email with any other questions you have and happy shopping! ps- I plan to offer a discount code for those of you who purchase BEFORE these cutoff dates, so you might want to sign up for my newsletter if you haven't already.